A phone with massive features. 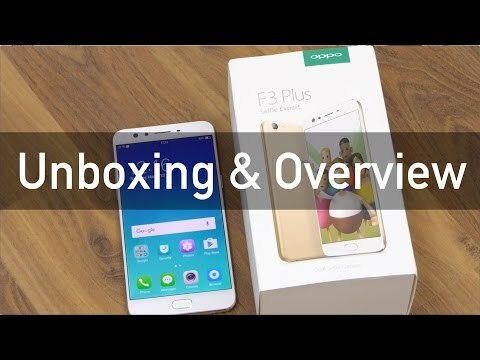 Oppo f3 plus is one of the best phones for the range. With good battery life. Great storage space and everything just perfect. This latest smartphone from Oppo offers some really good specifications at a good price. Has a great battery life and charges fast too with new technology. The cameras are too good as expected from Oppo. Bought this phone about 20 days ago and it&apos;s been a great experience using it till now. The phone features an incredible secondary wide-angle front camera for group selfies. Overall app performance and battery life are both very good The Oppo F3 Plus comes with massive ram and battery life. Oppo F3 plus comes in with a huge screen size. Though the display is bright and attractive yet the 6 inch size makes it tough to handle. Battery life is also good. Camera quality is also upto the mark. 38 Pricebaba users have written their experience with Oppo F3 Plus. If you own Oppo F3 Plus, please do leave your feedback too. Lowest price of Oppo F3 Plus price in India starts at Rs. 19,999 Oppo F3 Plus is available on Amazon at Rs. 19,999. Prices updated on 21st April 2019. Oppo, the offline brand in India has still got a strong position in the market. The new device launched is the much hyped Oppo F3 Plus. It is one of the latest selfie phone in the market & has to offer good specs as well. Of course that comes with a price. The phone has got a massive display of 6-inch & has a resolution of 1920x1080 pixels which gives the display a pixel density of 367PPI which sounds quite good in terms of crispness. And the display is protected by Gorilla Glass 5. And talking about the design, the phone has got an all metal unibody design that looks & feel premium but quite similar to existing phones. A new fresh look would have been appreciated. Coming to the performance of the Oppo F3 Plus, it has got Qualcomm Snapragon 653 Octa Core processor clocked at 1.95GHz & combined with Adreno 510 GPU. The performance of the chipset has proved to be good with other phones & this should run fine as well with 4GB of RAM. And on the software part, this phone runs on not the latest Android 6.0 Marshmallow out of the box & there are news of it receiving any future software updates. Beside, it has a fingerprint sensor embedded in the home button on the front. This is the area where Oppo F3 Plus passes with flying colours. On the front for selfies, you get Dual Cameras one with 16MP & other with 8MP sensor. The 8MP sensor could be used for wide angle group selfies whereas the 16MP sensor could be best used for solo shots. It also comes with screen flash for low light conditions. And on the rear of the device you get another 16MP camera that can record videos up to 4K. Coming to the storage, this phone has got ample with 64GB onboard which can further be expanded up to 256GB via a dedicated MicroSD card. Thanks to the huge footprint with a 6-inch display, Oppo F3 Plus can pack in a massive 4000mAh battery which supports Oppo's VOOC Flash charge technology. Unfortunately, there is no wireless charging support. It is a Dual SIM device accepting Nano SIMs in both slots & also support 4G LTE with VoLTE enabled for Reliance Jio calling via the native app.